Some say the Essence of Life is in the small little things we enjoy. Each of the items in this grouping are humble on their own, however, collectively these items provide flavor, color and a certain Wow! White Balsamic is not traditional in color, although very unique in taste; honey like with a vinegar twist. 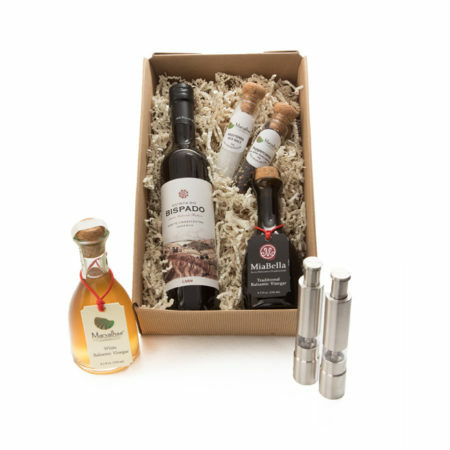 Our single Estate, Cold Pressed, Extra Virgin, Quinta do Bispado olive oil adds a subtle peppery Wow to all with which it comes in contact. The glass vials of Mediterra Sea Salt and 4 Color Peppercorn Blend together with Thumb Grinder set, means you can add flavor to your hearts content. The unadorned bottle of MiaBella Traditional Balsamic shyly holds liquid that has intensified over time. This Marvalhas Gift or indulgence for yourself, are of the little things that we should enjoy.